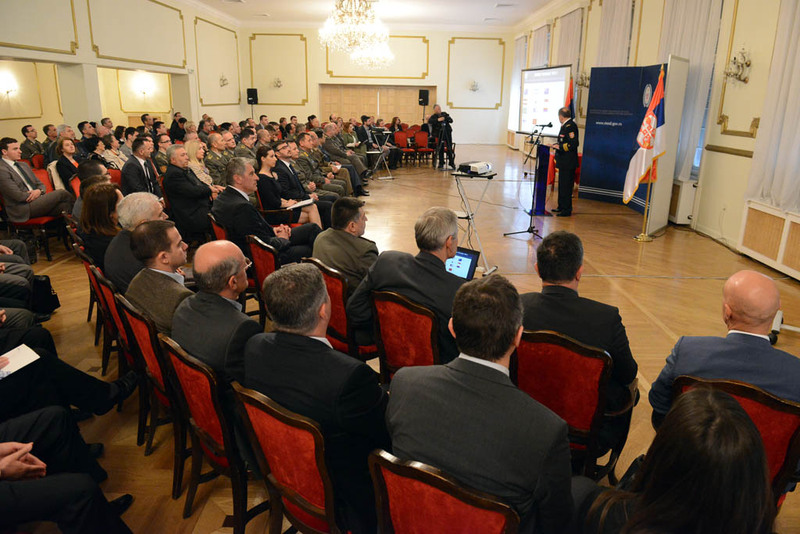 Today, a meeting titled “Codification in the Republic of Serbia – the first five years” was held at the Central Military Club, in organization of the Directorate of Standardization, Codification and Metrology of the Ministry of Defence. The meeting was attended by Head of the Strategic Planning Department of the Defence Policy Sector Brigadier General Slobodan Joksimovic, representatives of the Logistics Department of the Serbian General Staff, Central Logistics Base and the Military Technical Institute, and accredited military attaches to our country. In his opening speech, Director of the Directorate of Standardization, Codification and Metrology Colonel Zoran Spasojevic stressed the importance of product codification according to NATO standards, pointing out that the process of codification implementation, initiated five years ago, positively affects the promotion and development of the Defence Industry of Serbia and the overall economy of our country. - With dedication to codification and good coordination, we have made the Republic of Serbia one of the 11 sponsored non-NATO countries that are qualified and authorized to codify their products independently. Full capability for codification has been confirmed with the acquiring of the NATO Committee Certificate for codification in November last year in Luxemburg – Colonel Spasojevic said, adding that the codification system encompasses 62 countries which makes our products visible on the international market and facilitates their sales. According to him, the key to the present success lies in the implementation of decentralization of organization into two hierarchical levels, the first of which is the National Codification Bureau within the same Direction, while the other level are codifiers from the formation of the Military Technical Institute and the Central Logistics Base. Director of the Industry and Agriculture Division of the Chamber of Commerce and Industry of Serbia Jesa Ercic stressed that the Chamber, in cooperation with the Ministry of Defence and the Directorate of Standardization, Codification and Metrology, works on informing businesspersons about the advantages of entering the codification system and the new markets that it opens. Deputy Head of the Head of the Department for Defence Technologies of the Material Resources Sector Colonel Zoran Patic handed over five certificates to companies that were the first to certify means according to NATO STANAG 3150 and 3151 standards and ten certificates for the first national labels NCAGE to corporate subjects, state organs and non-governmental organizations. Codification is a concrete form of partnership cooperation within the Partnership for Peace program that Serbia signed with NATO. So far, 350 products used by the Ministry of Defence and the Serbian Armed Forces have been codified in our country. Considering the broad selection of products manufactured by the Serbian industry that are procured and used by the military, even greater interest of manufacturers for this process is expected in the future. The Direction has handed over 342 Serbian labels (NCAGE) to corporate subjects, state organs and non-governmental organizations from the entire Republic of Serbia.